Where you see co-ordinates these are based upon a decimal system rather than degrees, minutes and seconds. This drive is a very long and interesting one so we have split the drive detail into a few pages ... the start is to take a look at the maps and get a feel for the way points layout. Where you see waypoints (blue flags) bunched together expect to see a lot of interesting sights. In general waypoints do not indicate an animal sighting unless it was unusual ... this is because you can expect to see animals almost anywhere. You can verify this by looking at the distribution maps for the big 5 linked to from each page of the site. 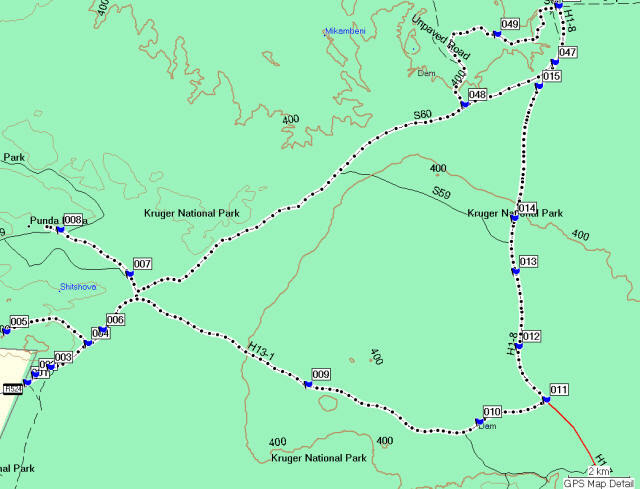 It took approximately 10 hours of driving to complete this drive up to Pafuri Gate (waypoint 029) and back via Crooks Corner (waypoint 044). It was a route that gave me a big scare as you'll see later. Where you see distances between waypoints it does not mean that you will not see exciting observations because in the Kruger you NEVER know what to expect at any point in time. 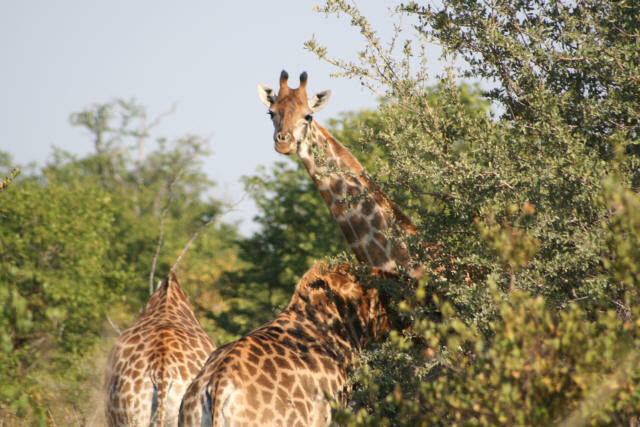 This is part of the magic and special nature of the Kruger National Park everywhere. each corner in the road could be hiding rare and magnificent sightings. On this page I cover the general layout of the drive before describing the way points and highlights of the drive. 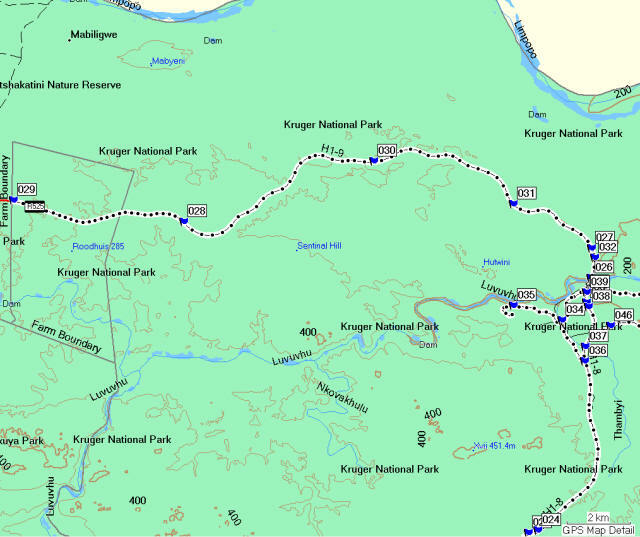 This first map gives you a good indication of the vastness of the Kruger National Park. It shows you the small corner (notice the concentration of the blue map waypoint markers) that I cover on this Punda Maria to Pafuri web page. It took some 13 hours of driving in total to cover the area's roads. This map will also provide with you some appreciation of the amount of traveling I will need to do to finish this website and why it will take me a year to complete the project ... so I hope you'll come back to watch progress. 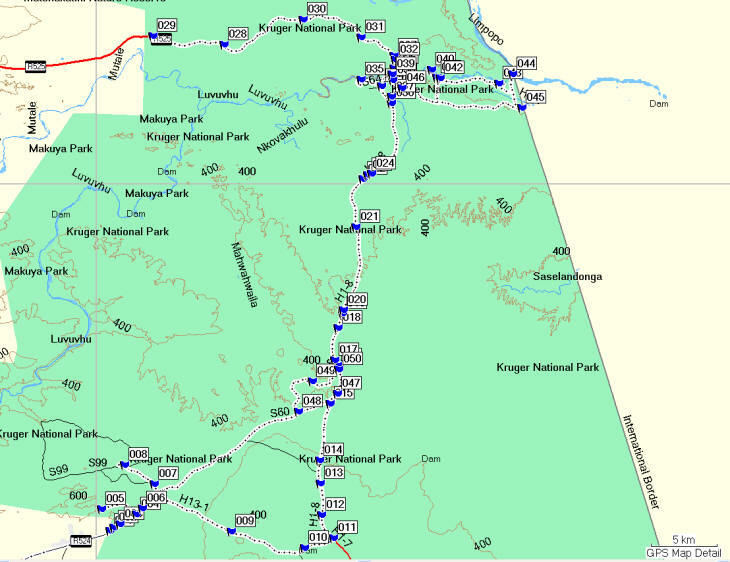 This regional map provides an overview of the complete drive from Punda Maria camp to Pafuri and back again. It shows the number of waypoints which will immediately tell you that it is special area with lots to see. This whole area is richly populated with elephants. You will see that the area to the west of the main road is more interesting topographically except at the very top of the route. The brown lines on these graphs indicate lines of altitude ... i.e. each point on a continuous brown line is at the same elevation. The darker the brown elevation line then the higher is that point. The first and last part of the drives are identified by the waypoint numbers ... the exact route I followed is indicated by the increasing numbers of waypoint values. If you look at this map for example Punda Maria camp is waypoint 008 so the next point was 009, then 010 and so on. You'll notice I returned to Punda Maria rest camp via the S60 road. This left a couple of roads not done ... the S59 and the loop around the Punda Maria camp site itself. The scale is shown on the map. This will give you an immediate appreciation of distances involved. By the way maximum speed on tar roads is 50km per hour and on sand or gravel roads it is lowered to 40 km per hour. Exceeding these speeds can be extremely dangerous apart from the fact that you will kill numerous birds and animals by traveling at high speed to say nothing of the fact that you will see very little as well. This map view shows the drive along the main tar road north. This is quite a long section to drive and a number of elephants can be seen. The drive is characterized by large areas of mopane tree and shrub scrub. Pafuri Gate is the northernmost entrance to the Kruger Park and is reached via the town of Messina that is on the South Africa and Zimbabwe international border. My track took me first to the gate before having to backtrack to drive some of the most exciting and interesting drives in the whole of the Kruger National Park. The people who control entrance and exit at Pafuri Gate told me they get between 6 and 12 cars a day entering at this point. 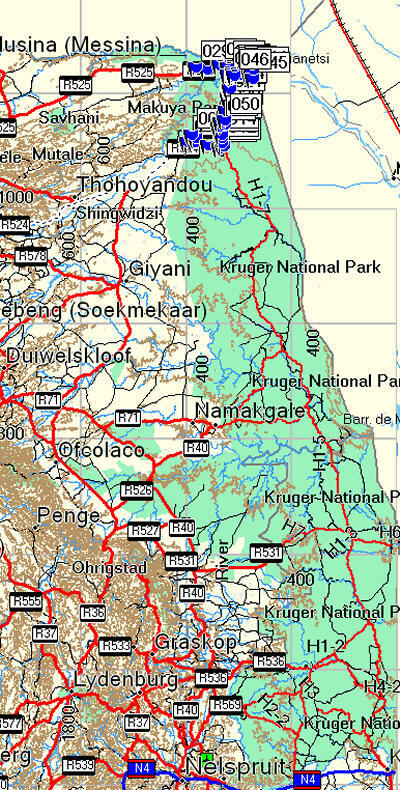 On February 25th 2000 the Kruger suffered from severe flooding and the high points were noted on road and tree markers. I will later describe the meaning of this flood in terms of the extent to which the water reached out from the main Luvuvhu river. The Luvuvhu River is one of the few perennial (year round flow) rivers in the Kruger. The Luvuvhu river is a tributary of the mighty Limpopo River and they meet at Crooks Corner. Luvuvhu refers to the Venda name for the River Bushwillow tree (Combretrum erythrophyllum). The river at times has gone by the name Pafuri, Lebubo, Levubi, Limvubu and many others (see reference at bottom of page). 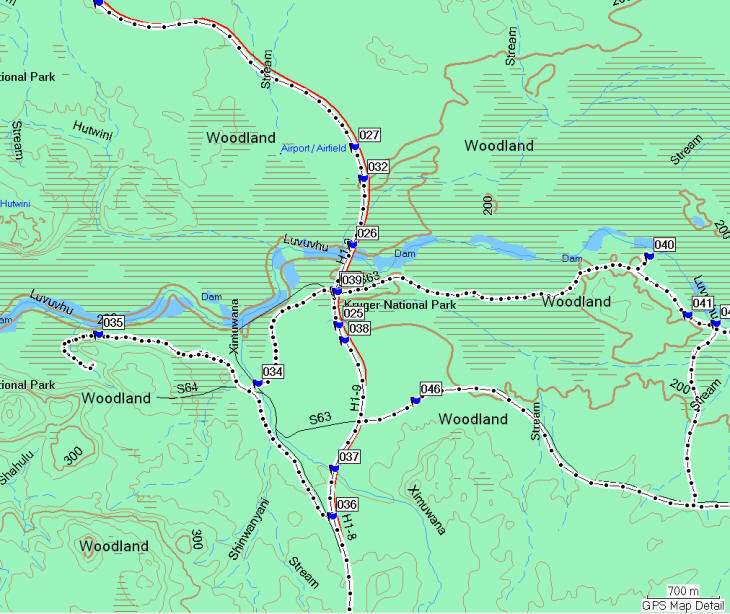 This map section of the Punda to Pafuri drive shows the most interesting section of the whole drive. The short cul-de-sac Nyala Drive (waypoints 034 and 035) was especially exciting. This is shown in a larger scale on the map below. The map is shown in some detail and this drive is well worth a whole day in itself. Birdlife is extremely prolific as is animal, plant and tree life. The riverine environment of course creates even greater interest. As much as the Luvuvhu is a perennial river there is still a need to create dams (see map) to provide sufficient pools and holding water for a contact supply of living space for animals like crocodiles and hippos as well as providing sufficient drinking water for all the land based creatures in the area. Waypoint 040 is the Pafuri picnic spot where you can get out of the car, relax and see wondrous sights. Notice the extensive woodland areas and hillside topography. 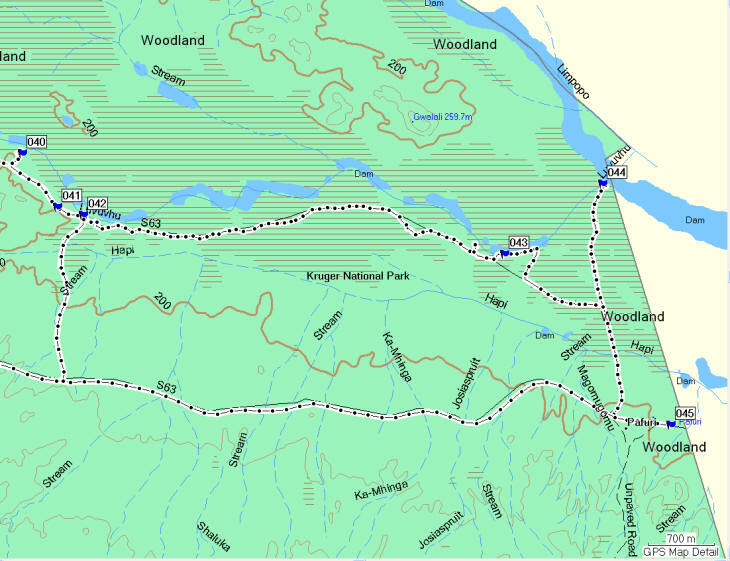 The northern section of the Luvuvhu river loop is by far the most interesting and spectacular. Almost every metre of the drive has something to offer with many river view lay-byes. Point 045 marks the border crossing and police station at the Mozambique and South Africa border. As the new Transfrontier park develops this crossing point will develop in importance. Point 044 is the confluence of the Luvuvhu and Limpopo rivers also known as Crooks Corners. Notice the relative size of the Luvuvhu compared to the Limpopo. 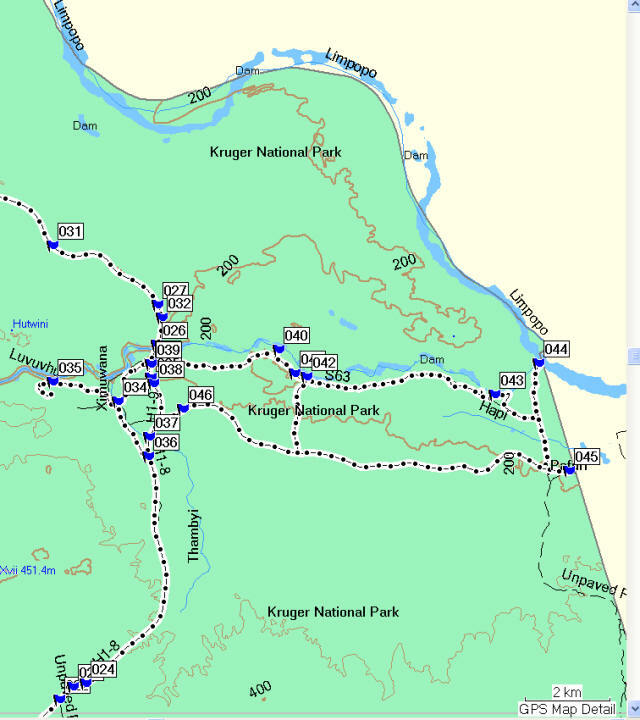 To plan your own drive and stay consider the information created throughout this route as marked by the waypoints 009 to 049. Click this link to get a taste of African Adventure.